Riding our ponies into a zombie powered future. 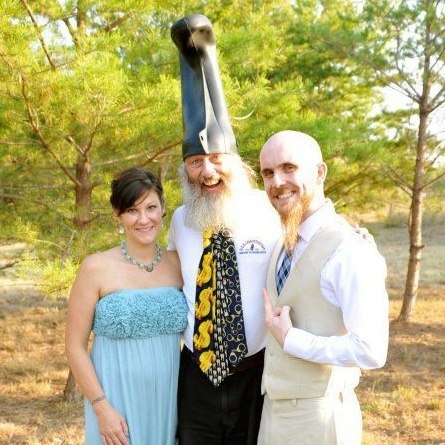 Vermin Supreme is an ordained Wizard and Time Lord with the Universal Life Church. Vermin has been granted the ability to perform perfectly legal wedding ceremonies. Getting hitched ? Why not let Vermin tie the knot ? As the first couple joined in matrimony by Uncle Vermin, Sam and I extend a hearty congratulations to those looking to do the same. Remember, anarchist, that the real union comes not from the blessings of the State/corporate overlords, nor from the religio-fascist entities controlling society.. The convergence of souls, the union of hearts, and the sacredness of your relationship lies within you. But if you’re lookin’ for one Supreme wedding, there ain’t none like this. Enjoy the party, kiddies!